In the dream, I’m lying facedown on a broad, six-foot-long leaf while being drenched from above by a warm tropical rainstorm. The rushing water cascades off my back and pools briefly between my head and the crooks of my arms before seeping away beneath, tracing the veins of the leaf as it swirls away from me. When I went to bed in Milwaukee last night, it was two degrees. Live long enough with that kind of cold and your body starts to guard itself against it. 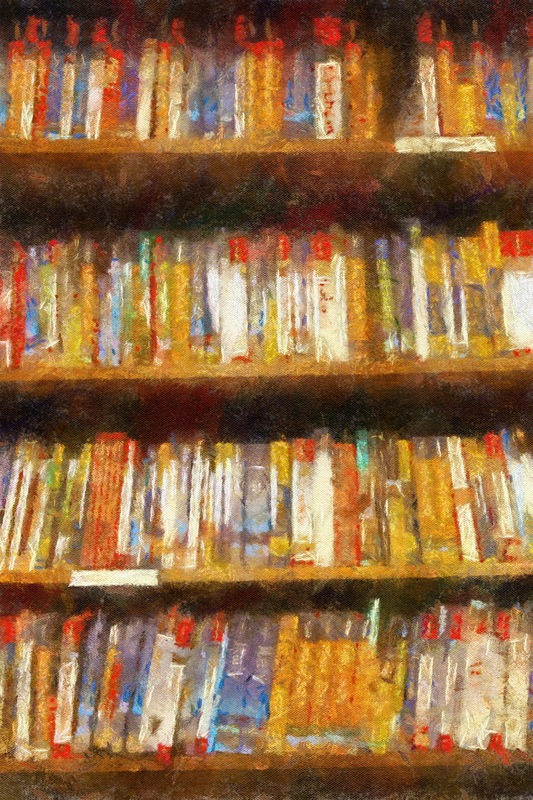 You develop a clench you can feel deep in your core. As if your body is bracing in anticipation of inevitable blows. And now, in this dream, under this baptismal flood of water, I feel myself finally letting go, releasing, and allowing myself to relax the knot in my chest that’s been girding against the cold these long months. And all I feel is gratitude. I really am lying facedown on a huge leaf under a torrent of warm rain. But instead of dreaming, I’m wonderfully awake. I’ve just arrived at the AAA Five Diamond Fairmont Mayakoba resort in Mexico’s Riviera Maya, and I am gratefully submitting to the Cha Chac Rain Ritual treatment at the Willow Stream Spa. The “leaf” beneath me is a monumental treatment table, hand-carved out of a single piece of mahogany into the shape of a broad leaf. The veins of the leaf are inverted, indented into the table rather than carved in a raised relief, and they serve as channels to drain the running water down and away from my body. A layer of cornmeal, oats and local clay has been gently applied to my body to pull out toxins, and this exfoliating poultice, along with my busy thoughts and physical tensions, washes off and away from me. Then I’m gently rubbed with sage oil while my head fills with the scent of copal incense. It is, to say the very least, a nice welcome. Hell, it’s a rebirth. The Fairmont shares the 1,600-acre eco-friendly Mayakoba development with two other world-class resorts: The Rosewood Mayakoba and Banyan Tree Mayakoba. Mayakoba has won a raft of awards including recognition from The United Nations and The Rainforest Alliance, for its dedication to sustainability and ecologically responsible practices. There are no cars here. 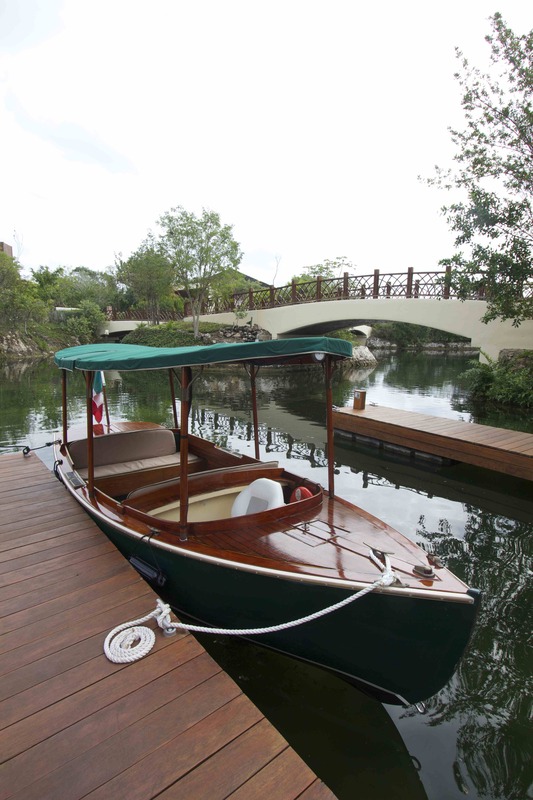 All vehicles are parked at the road entrance, and guests are escorted around the grounds in electric carts or invited to make use of the many bicycles offered for complimentary use throughout the resort. Rooftop mineral pool overlooking the treetops at the Willow Stream Spa. There are no towering high-rises here. The scale of the architecture does not aspire to rise higher than the forest canopy with which it so sensitively integrates. As you walk or bike the meandering cobblestone walkways, or glide through the canals via the charmingly nostalgic lanchas, the overwhelming impression is one of harmony. It’s a nice feeling. While the Fairmont Mayakoba is an ideal place to laze and just do nothing at all, it also offers a wealth of activities for visitors, and is a great destination for families. The three resorts encircle the renowned 18-hole El Camaleón golf course designed by Greg Norman that is home to the only PGA Tour event in all of Mexico: the Mayakoba Golf Classic. It’s the only PGA tournament held outside of the US and Canada, and if you’re an ardent golfer, it’s a pilgrimage destination. The Discovery Club & Adventure Camp offers a wonderfully varied schedule of fun activities, and allows parents to pursue adults-only experiences in the meantime. Our son, Graeham, visited the Discovery Club on a pirate-themed day and happily constructed a treasure chest, made a cardboard cutlass and had a blast exploring a wood and rope labyrinth in the private and secure playground area while making new friends. Other days, the staff led the kids in making piñatas or origami. The staff was exceptionally friendly, alert and professional, and we felt totally at ease leaving our child in their care for a few hours. The best part is that the resort gives families three complimentary hours of kid care — per kid, per day — for children ages 4-12. The aforementioned Willow Stream Spa clocks in at 20,000 square feet, with 20 treatment rooms, steam, sauna, Swedish showers, multiple indoor and outdoor lounges, and heated rooftop mineral pools that are really, really hard to leave, especially when the sun is setting over the tops of the trees and twilight brings a dreamy cast to the waterfalls and you shudder at the thought of returning home and start to think how it is perfectly rational to consider that maybe you should sell everything you own and move to the Yucatan and…sorry, my mind wandered for a bit, where was I? 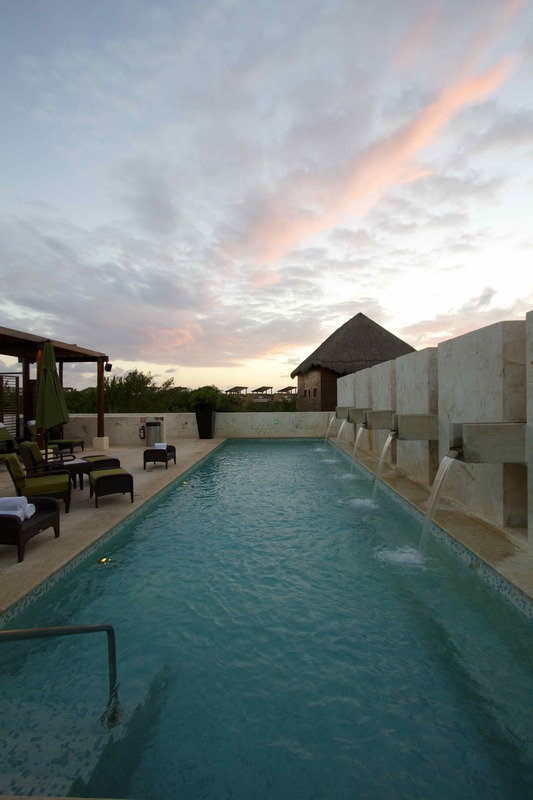 The adults-only infinity-edge pool at The Fairmont Mayakoba. The Yucatan Peninsula is basically a huge, porous limestone shelf, all of which used to be at the bottom of the sea until an ancient seismic event lifted it out of the water to become part of the landmass of what is now Mexico. When the creators of Mayakoba cut the canals to create the channels that make up the resort, they salvaged the huge quantity of limestone, removed and repurposed it to face virtually every building in the resort, including the walls of our own bath and the interior and exterior walls of the spa. Lying back in Willow Stream Spa’s rooftop mineral pool you can study the whorls of prehistoric plant fossils or the remnants of seashells embedded in the expanses of white stone. No visit here is complete without an experience of this serene spa. Access is free if you have ordered a treatment. And here’s a tip: sign up for the Fairmont President’s Club on their website (it’s free) and get discounted spa entry for a mere $20 per person per day, and access to the health club for free. Membership also entitles you to free WiFi and in-room internet access (a savings of $20 a day) and much more. Fresh local scallops, octopus and shrimp with coriander, chaya and sour orange at El Puerto, at The Fairmont Mayakoba. Water is the living heart of the Fairmont Mayakoba. The soft, lulling rush of it is always present. From the moment you turn into the entrance from the road to the crashing waves of the Caribbean sea at the resort’s far end, you are treated to a soothing experience of water. Fountains are everywhere, gushing from the buildings themselves, forming sculptural art with colored lights and splashing into tranquil pools seemingly around every corner. 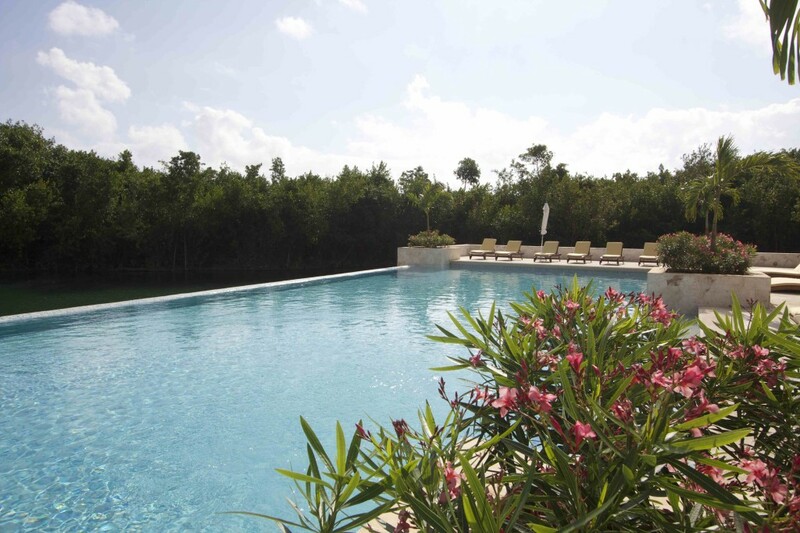 Five swimming pools guarantee that you are always mere steps away from a cooling dip. Our favorite was the 10,000 square foot free-form pool complete with waterslide, children’s play pool, and an infinity-edge pool just for grown-ups featuring peaceful views of the lagoon. A Monte Xanic Mexican red, one many terrific wines served at El Puerto at The Fairmont Mayakoba. The Fairmont is not an all-inclusive resort, though you can opt for packages that give you that arrangement if you prefer. Dining options here are varied, and you can pick up anything from a deli sandwich to a four-star gourmet meal that will earn a bright spot in your memory book. The reasonably priced Café Maya, centrally located in the middle of the resort and steps from the largest pool, serves deli-style sandwiches for here or to go, coffee drinks, wine and spirits, and also functions as a gift shop with all of the little necessities you might need but forgot to pack. And no matter where you might be at the resort, a nearby attendant is always happy to make a call to bring you anything you need. When we needed a pair of water wings for our son, someone crossed the resort with them in less than ten minutes and only added a very modest charge to our room. Nice. Close by is La Laguna Restaurant & Lounge, a warm, multileveled restaurant with high vaulted ceilings and an outdoor deck that juts out over the lagoon. It’s a relaxing place to sit with a morning cup of coffee and watch the exotic local birds perched along the railings as they look longingly at your scone. La Laguna serves a brunch that resists pat descriptions. Local traditional dishes? Check. Familiar American and European breakfast favorites for homesick travelers? Check. Eggs any way and with any ingredient you can name including some local curiosities that would yield a triple-word score in Scrabble? You better believe it. And there’s more, with a dozen different types of fresh fruit smoothies and tropical juices, Spanish jamon iberico, dozens of cheeses, countless fruits, breads, interesting hearty dishes with chicken, beef, fish and really there was just no end to it. And it changed every day we visited. The Fairmont is most known, however, for its high-end fare, including not just one, but two AAA Four Diamond Restaurants: El Puerto in the main building overlooking the lagoon, and Las Brisas, located right on the beach with sweeping panoramic views of the blue Caribbean. Both are grand spaces, with alfresco seating as well as elegant formal dining areas. El Lobby Lounge is a lofty, windswept balcony that is beautiful at all times of day. You might be tempted to stick to those wines from your favorite regions, but heed your sommelier and sample something you might not even know existed: first-rate Mexican wines. While wine grapes have been cultivated in Mexico for centuries, Mexican wines have historically not been well-regarded, usually thought of as cheap, one-dimensional quaff that you drank when you ran out of tequila. That’s no longer the case. Mexican wines have come of age. 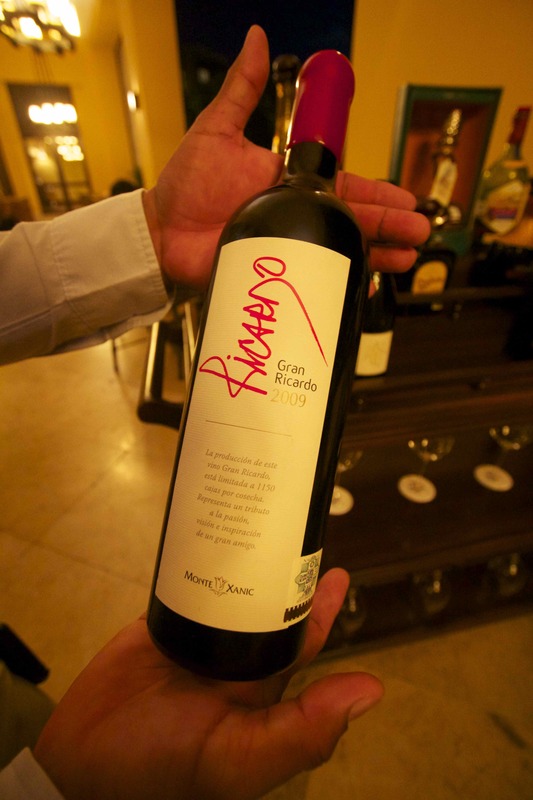 I had been surprised by excellent Mexican wines visiting the capital Merida last year, and so I put myself in the hands of El Puerto’s wine master who happily offered examples of why he was so proud of the new generation of Mexican wines. While no grapes are sourced directly from the Yucatan—they just don’t have the climate or the soils for it—the wines made with grapes from the other seven grape-growing areas of the country demand serious respect. Look for Monte Xanic Chenin Colombard (a great value and a good accompaniment with fish), and Rincón de Guadalupe Tempranillo. Such an unassuming name for one of our favorite places at the resort. 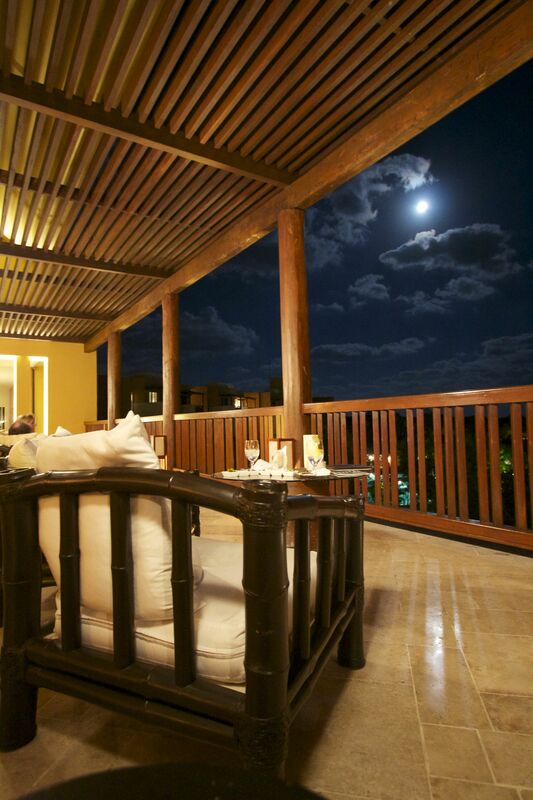 Even on those evenings when we dined at the more exalted restaurants at the resort, we often ended our evenings listening to soft latin guitar on the windswept balcony of El Lobby Lounge. Here you can settle into an outsized easy chair and let the breeze wash over you as it races from the sea over the tops of the trees. 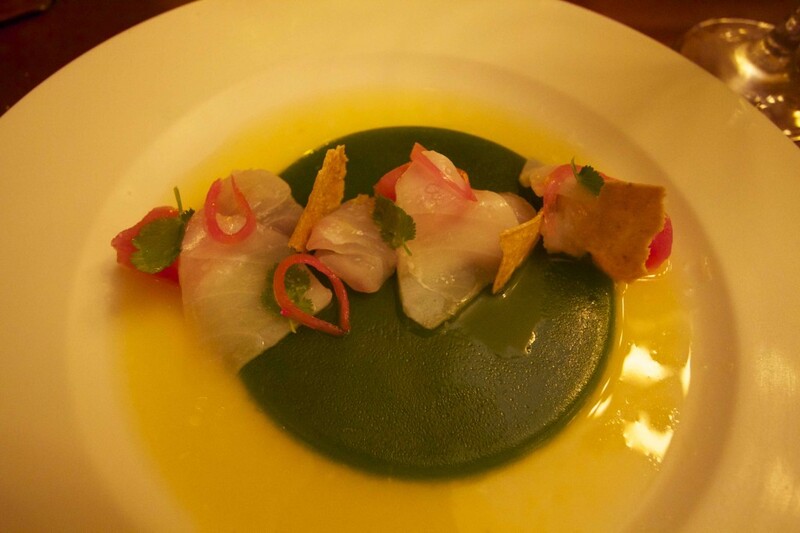 They have a great cocktail menu and also offer an eclectic menu of botanas, tapas-style small plates. Order three or four and cobble together an interesting meal to enjoy while you watch the moon rise. They say that the Caribbean has seven different shades of blue. Walking down the beach, my wife and son and I try to put names to the colors. The shallows are the colors of Robin’s eggs, further out changing to cornflower blue, gradually deepening into the darker shades of clematis out past the breakers, and finally to the purple-black of the deeps beyond the reef. We look for shells, bits of coral and other treasures returned by the sea. The sand is soft and the water is bathtub warm. In the end, this is why you come to the Riviera Maya. To live for a time in a dream. And this is why we’ll return again and again. 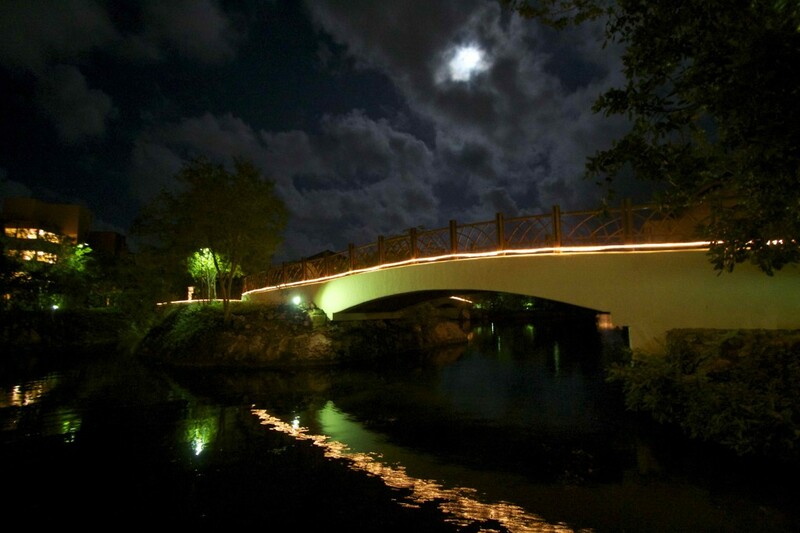 A footbridge over a lagoon at the Fairmont Mayakoba. I’ve discussed this before, but misinformation persists, so let’s just dispel any irrational fears right here. Back in November of last year, the State Department released a traveler’s advisory for some parts of Mexico, all of which are hundreds of miles from the Riviera Maya. There is no traveler’s advisory for the entire state of the Yucatan. The Riviera Maya is safe. Very, very safe. Much safer than Milwaukee by any statistical measure. In fact, the city of Milwaukee has 700% more violent crime annually than the entire state of the Yucatan. So rest assured, the Riviera Maya is a very safe place for your family vacation. Millions of Americans visit there annually. If you’re smart, you’ll be one of them. When You Go AirTran, Delta and other carriers fly to Cancun out of Mitchell Field. 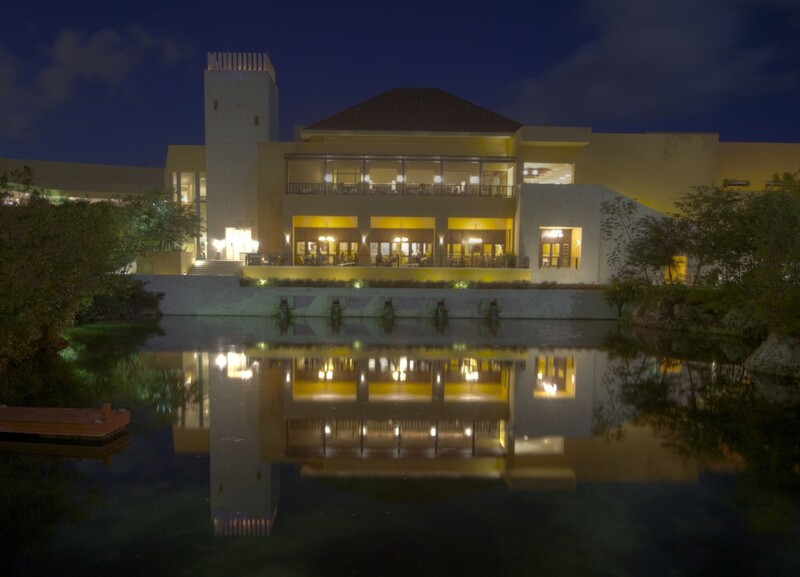 The Fairmont Mayakoba is a quick, 40-minute drive south from Cancun Airport. Tip: if you don’t have school schedules to worry about, April is a great time to travel to the Riviera Maya, as hotels frequently offer significant discounts and conditions are ideal.